I know, I've written this before, but I adore hanging my family's laundry out. It's one of my favorite household chores, so much so that it's more of a ritual than a chore. Because of snow and lack of long hours of sunshine in the particular spot where our laundry tree is located, we don't hang out the laundry much past October, and we don't begin again until about March, so with the arrival of spring, comes the arrival of flapping sheets. It's a great time to be outside, to pause a bit, soak in some sunshine and sea breezes, talk to the birds that always come out to see what I'm up to, and it's time I take to observe the subtle day-by-day changes in the garden. It's also an act of sustainability. 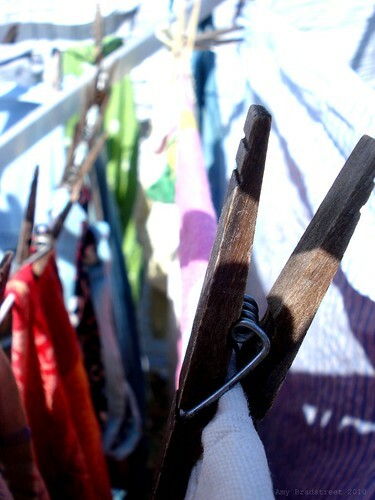 While saving money on energy, we're also being gentler to our clothing, and saving wear on our dryer. Our laundry tree was a bargain, compared to our dryer, at only $35 from a local hardware store. 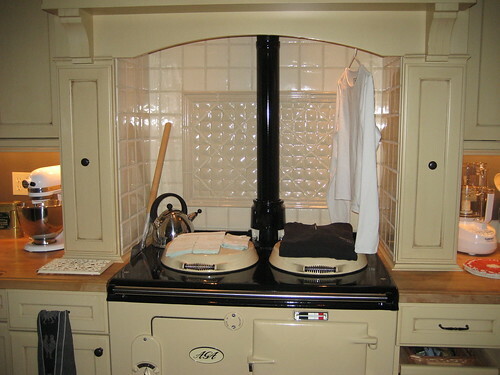 It holds four large loads of laundry at a time, too. It's also becoming an endangered act, as too many neighborhoods are trying to forbid hanging laundry out, which of course is absurd and outrageous, but it's spurred a movement of clothesline activists, of which I suppose I'm a part, as are many of our friends and family. It's a simple pleasure, for sure, hanging out the laundry. 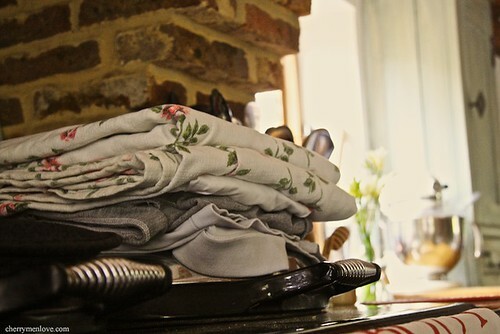 The crisp cloth napkins always smell fresh and never need ironing, nor do the table cloths. The joy of turning down the bed in the evening and sliding in between sheets that are scented of the sea and sun, especially on hot summer nights is one simple pleasure I am very grateful to have, and it's truly a rite of spring around these parts. Just amazing that a neighborhood can get so upset about drying clothes outside. 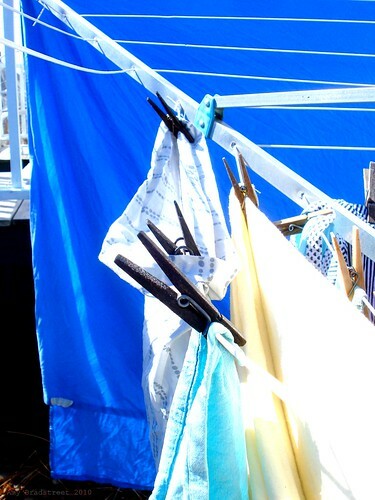 If the neighbors are too freaked out by a clothesline (a permanent addition to the yard) perhaps they could be gently conditioned to the idea by seeing a nice portable clothes drying rack being used on the patio or deck during the warm months? Yeah, it is not allowed in our neighborhood. A bunch of us in our HOA went to request that they remove that rule, since it is A NEW URBANISM GREEN BUILT NEIGHBORHOOD (d'oh!). They thought about it for a few months, and last week said no, can't change it, no clotheslines. So annoying. Yet people can have every kind of plastic garbage/toys in their yard legally. Grrr. I drag portable wooden racks out onto my deck when the weather is good for it. I love the ritual, smell, sun, process of line drying. Ahhhhh. I am like Denise, I live in a place where I can't have a line. It is called an apartment. I do have a wonderful clothes drying rack that I put out on my deck. So I can have the benefit of sunshine on my clothes too. We have a group that is getting ready to go to the apartment complex management to ask them to put up a communal clothes line. This will be great for my everyday clothes that I don't think anyone else would want. But I still would keep my favorites on my rack on my deck.